RollSafe is an MDMA education website. MDMA is not risk-free. Please read RollSafe. RollSafe is concerned with public health and the safety of people. We do not endorse the acquisition and use of MDMA outside of approved medical settings. If you’re likely to use MDMA anyway, please do your research. Read the complete guide to MDMA, including what it is and safety information. MDMA, Molly and Ecstasy aren’t always the same thing, even though they’re often used interchangeably. 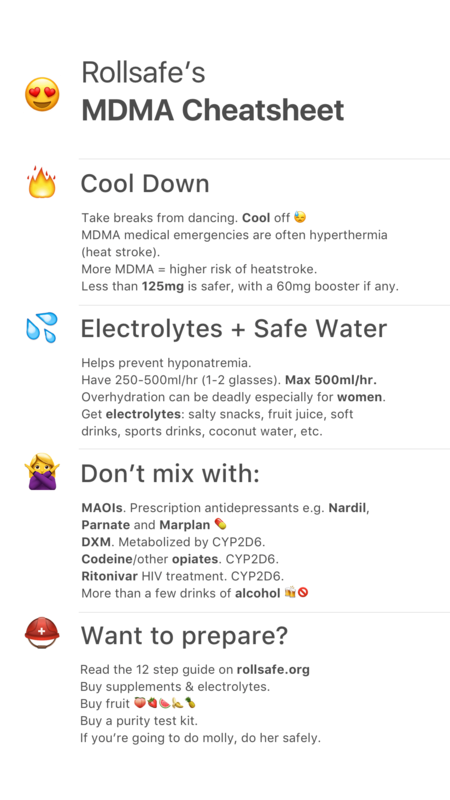 A guide to taking MDMA (Molly/Ecstasy), should you choose to use it. RollSafe’s recommended MDMA supplements. Supplements like Alpha Lipoic Acid, ALCAR, Vitamin C, Co-Q10 and some others have been shown to reduce or prevent MDMA-induced neurotoxicity in rodent studies. RaveBox is a reasonable all-in-one supplement kit for MDMA. The downside is it costs more than buying in bulk, but it’s pretty decent value and free shipping worldwide. An overview of the drug Molly. MDMA is a psychoactive drug, and the term Molly generally refers to MDMA. An overview of Ecstasy - the pill form of MDMA. Learn the ingredients in the drug Molly. Learn the side effects of MDMA, including anxiety and feeling cold during use. How Does Molly Make You Feel? Learn how Molly/MDMA makes you feel. There are some pretty great quotes on this page. The recommended test kits for MDMA (Molly/Ecstasy). 87% of “Molly” analyzed by the DEA between 2009 and 2013 contained 0% MDMA, instead mostly containing “bath salts.” Use a test kit to reduce some risks, but know that even test kits cannot guarantee purity. Research based information on MDMA (Molly/Ecstasy) dosage: read why you should take less than 120 mg of MDMA per session. If you roll at music festivals, roll safe. We created these pages in the hope that they’ll help attendees be safer (and generally have a better time), and to help organizers see ways that they can improve the safety and experience of people who attend their festivals. Includes: What people wish they’d known before they first went to Coachella, what made Coachella safe and unsafe for them, and what was good and what was bad. Supplements and drug testing do not guarantee safety. We cannot answer questions over email. Try searching Reddit, and if you cannot find an answer, post a thread on /r/MDMA.